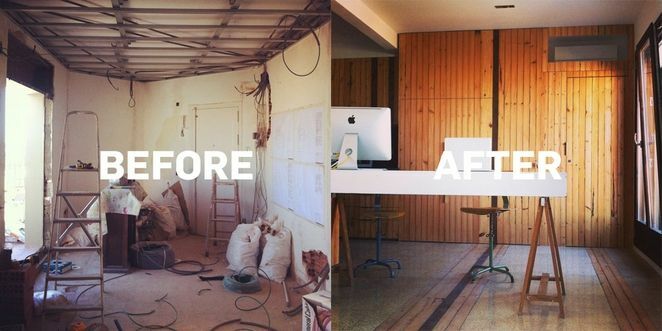 The eco-renovation of yök Casa + Cultura is still in full swing but this week we moved into our office. This small (35m2) yet multi-functional space, equipped with a kitchen and toilet, serves as our reception as well as event space. The best thing about it: our terrace, overlooking Barcelona. Up here on the 8th floor, an extension from the 70ies to the original building from 1900, there wasn’t much to salvage. However, we decided to restore the traditional terrazzo we discovered under a glued layer of cork in order to save extra material like for example a cement or wooden floor. In order to make the space cosier, we added wood to the interior. Our carpenter David used some salvaged timber sleepers he obtained from the Catalonia Railway Museum in Vilanova, a nearby town, and turned them into a beautiful interior. The kitchen countertop, ECO by Cosentino, is also made in Spain, from upcycled material such as mirror, glass, porcelain, earthenware and vitrified ash. The company claims that 94% of the water used in its manufacturing process is re-used. We also like that it is highly durable and easy to maintain. All our appliances are energy-efficient and A+ or A++ certified. The AC, which we hope to use only in the very hot or very cold weeks, is also A+ certified, both for heating and cooling. In order to minimise the use of the AC/heater, we made sure we can cross ventilate the space. Insulation is also key. The ceiling is insulated with a layer of Isonat wood fibres and Knauf’s A+ certified low-VOC drywall. We installed new wooden doors with double glazing and are in the process of installing a plant pergola on the terrace to create shade on the outside facade. If our budget allows it, we will install a vertical garden to further insulate the space from the outside. We also took care of basic things like VOC-free paint and a DIY lighting installation made from a minimum use of material and LED light bulbs. Our light switches and plugs (large image above), collection 5.1 designed by Oriol Guimerá for Font Barcelona, are made locally from brushed stainless steel which makes them very long lasting and recyclable. We use second hand objects and locally made furniture from certified wood, and are looking forward to receiving the clamp-a-legs by DE VORM, to make flexible tables with salvaged table tops. Although we had our doubts about Roca’s w+w toilet (a toilet with an integrated sink and gray water recycling system) due to the large amount of material it uses and its high price, we realised that it was the only way we could have the bathroom in the small space suitable for it. Of course we like the fact that it recycles the gray water. Barcelona’s tap water isn’t very nice to drink unfiltered, so to avoid bottled water we installed reverse osmosis. The wastewater is being collected in a tank on the roof so that we can use it to water the plants and for cleaning. The kitchen tap, L20 by Roca, has an integrated aerator and cold-start. On our to do list are bee-friendly plants on the terrace to help cool down the place while providing food for urban bees, and, a washing line to dry our clothes energy-free. All of this will be ready when yök Casa + Cultura opens the apartments from july 28th!